The Bingo Hideout office was buzzing with the shock news that we picked up over the weekend on twitter that Johnny Depp was dead. We all – like many others – took to google to try to find out the latest news on the tragic tale, only to find that this was a rather nasty and tasteless hoax. The team in the Bingo Hideout office are totally fed up with the constant hoax stories of celebrity deaths, never a day goes by without a story regarding Miley Cyrus apparently kicking the proverbial bucket. What is wrong with some people haven’t we all suffered enough hearing the true stories of tragic celebrity deaths like Michael Jackson, Brittany Murphy, and our own Stephen Gately? It is good news that Johnny is reportedly very much alive, well and is reportedly in France. 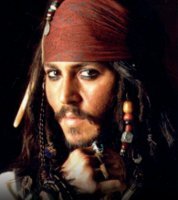 Johnny Depp has reportedly sent a message via a friend on Twitter informing fans that he is ok. Hopefully now this story will, as it were, die a death and we can all look forward to seeing Cap’n Jack in the glossies very soon. Why anyone should want to make such mischief is beyond the team in the Bingo Hideout office, and we hope very much that the awful culprits of this shock hoax story themselves never have to cope with such a horrid scare – we can’t imagine what close friends of Johnny Depp must have been thinking when they saw the news spreading like wildfire. Get a job and a life hoaxers! What do our Bingo Hideout readers think, should these awful people be named and shamed by their friends? With so much tragedy going on in the world it really is so sad that these ‘people’ and we use the term loosely, can’t find something more productive to do with their time. Here endeth the rant!